A/N: This image came up on my twitter from (@srigawntufahr) and I loved it and this story came to mind right away. There as a quote as well but it was the picture that really struck me. He laid flat on the concrete, arms spread out along the hard cold ground. His knees were bent up, obscuring his view of the world in front of him. He only saw the wide open sky above, nothing more. Just a long black expanse with only a handful of puffy grey clouds. As a child those clouds were animals, household objects or weird shapes that he had made up names for. Now they are mounds of water that he could never hope to reach, never understand and never wanted to be a part of. Feet flat on the Earth, that was his place. No matter what she said. He let out a slow breath, slowing his heart rate and closed his eyes. Here he was safe. Inside his head he was free. Inside his own thoughts no one could come after him. No one could tell him he was wrong. Tell him yet again he had broken some stupid rule. He was a failure in the outer world. In this one he was just a man. Just a man who wanted to end up on the side where good was still a way of life. If good was even still a knowable concept. A pitter-patter of footsteps pulled him out of his thoughts. He opened his eyes, the sky was still mostly black. He had been a child the last time the night had been anything but a suffocating blanket. “You have wings?” the voice was gruff and angry. The man on the ground didn’t bother to answer. He just acted as if he had not heard the speaker at all. “I said,” the speaker kicked the man’s side. “You have wings?” He wasn’t asking now, he was demanding an answer. The man set up, giving the intruder a clear view of his unobscured back. No slits, no scars and no feathers. “That answer your question?” he snapped, looking up at the person who had disturbed his minute of solace. “Name,” the tall man demanded. He was dressed in a black coat and black pants. His feet were covered by granite grey combat boots. With only using half his strength he could break ever finger in the man’s splayed hand. “Julius,” the man answered, pulling his hands into his lap for safety. Julius gave him a scowl and nodded. He could argue but that would only end up with him in the constantly restless ocean behind him. Where he would be forced to tread water until he passed out. Tomorrow he would end up in the pile that burned. No one would know he was gone and no one would care, except maybe her. If she still had the capacity for any real emotion. The officer strode off, hands in his pockets. Julius watched him get swallowed by the darkness before he pushed himself to his feet. He looked out across the inky ocean, wondering if drowning was really as horrible as everyone said. He decided not to test the idea tonight. He had already played fast and loose with his life enough for one night. He turned his back to the expanse and faced his home. A city of tall, square identical buildings stared back at him. Every single one was grey, with the exact same brickwork and number of windows. Addresses were the only identifying markings on the buildings. Finding where you were going always took an extra twenty minutes and ended up with you wanting to punch something. He stood on the perimeters guard wall. It towered above the rooftops, giving a clear view of the entire settlement. No one was out, no lights shone. He started down the stairs he had come up. Stopping on the first landing he looked up at the set of wings that adorned this side of the wall. They were made of steel, cold black steel. The detail work would make any artist feel like an amateur. Each wing had intricate lines and veins criss-crossing the sculpted feathers. From here they looked so real. He wanted nothing more than to hold them and disappear into the sky with them on his back. But he knew better. Those were cold and hard, created by machines. They matched the pair on each side. There were exactly five hundred of them spaced intermittently over the whole wall. Like the real thing they held no warmth and no worth. Just pretty images to please the eye and excite the heart with falsehoods. He turned away from the facade and slowly picked his way down the cold stone stairs. It was stupidly dangerous to be up here, he knew that. Only the winged ones were allowed on the wall. The winged ones could enter every building and walk every street. Those like him, the unfeathered, were restricted to their specific streets and their own homes. Nowhere else. He made it back to his hovel without incident. It was the end of the month, the officers are enjoying a night off. Tonight was the only sort of safe night of the month. He closed the door to his apartment and slid the lock into place, as if it actually did anything. He didn’t change, his white shirt and pants were not close to dingy yet. They remained on until their glow faded. Only then would he change. Only then would he begin to feel the cold slipping through his veins. The pain would start to crawl over the skin on his back. Once the first spots began to form on the whites the slits began to open and the wings started to grow. He never let the first feathers appear. They could not see the light of day or he was doomed. If those feathers were seen he would become one of them and he would cease to be human, to be Julius. He must not become a winged one, ever. He slept in intervals of sixty minutes, same as every night. One hour of sleep, twenty minutes of surveillance. It was a tactic he had learned from his parents. It had served them well for years but no practice was perfect. Sooner or later it alway failed. Sooner or later they came and the charade would be over. The night was a calm one. No one was taken and no one became a winged one, as far as he knew. He saw no new faces being ushered up steps and heard no screams or hurried footsteps. The calm nights were the worst. He had no clues and no hints of what was hiding behind his neighbors walls. Tomorrow could be the end or it could be just another day. At least with noise he knew what was coming. The sun began to rise straight into the clouds as it did every morning. He loved the last hour before dawn, because it was the only time he saw just pure sunlight, nothing around to obscure those beautiful rays. For a very small amount of time the world was bright and alive once again, like it had been when he had been very young. There was no darkness, only bright vibrant colors that just begged for your smile and laughter. For a handful of minutes the world wasn’t dead and then it all faded away and he reentered reality. He unlocked his door at nine o’clock like he did every morning. It was law that during the day anyone could enter your rented space whenever they liked. You played gracious host no matter if they were winged or unfeathered. He prayed he would be left to himself today. He was not in the mood to be a play actor. He hated his part, all smiles and kind words when in realty he was screaming for them to leave or kill him. The knock was a quiet one. It was not a winged one, they never knocked. He opened the door just as the second knock finished. On the stoop stood a small female child, hands folded in front of her. Her face was covered with a tangle of black hair and her whites had begun to fade. “What?” he asked gruffly. He saw the tears free-falling to the ground, the wobbly legs, and shaking hands. This child was in sever pain. “I need a new set,” she cried. “I don’t want to become one.” she finally looked up at him. Her face smudged with dirt and the tears had left deep stains on her cheeks. She had been begging house to house. As she looked up, her hair moved the side a few inches. Just through the tangle he saw it, a dark grey tip of a brand new feather. “Too late,” he slammed the door on the doomed child. He turned away as her cries increased in volume. She could scream and curse him. Her tiny fists could try to break down the door but it wouldn’t make him flinch or turn to help. She was gone. He knew she would lose control, try to tear out the new appendages until they were nothing but bloody strings. That was what his mother had done. It would do no good. Minutes later fresh feathers would reappear and that would be the end of it all. You stopped screaming and you stopped crying. 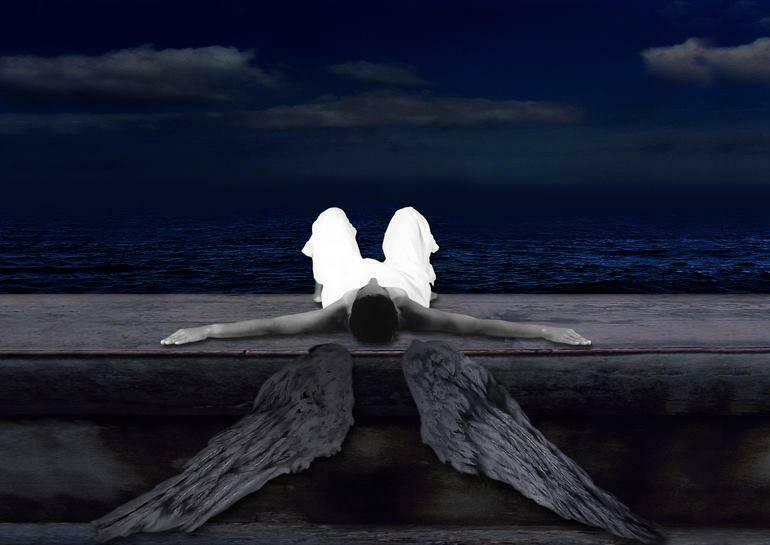 The wings unfurled and you soared up into the free air, never looking down and never looking back. No longer did anything or anyone matter again. It was just as he was finishing dinner that Jack showed up. He burst through the door letting it collide with the wall. He always entered the same way with a flourish of sound and energy. Julius didn’t even flinch. He just gathered his plate and fork and turned to the sink. He began to clean them while his former best friend entered the room. “Ugh, still?” Jack asked. Same question every month. “Always,” Julius replied placing his dishes in the drying rack. “I just don’t get it,” Jack sat at the table, his great wings folding around the back of the chair, making it completely disappear. “Why do you bother? It isn’t changing. Every day our numbers grow and your numbers shrink. Give it up already,” Jack said. Julius leaned against the counter his sparkling white outfit almost glowing in the dim kitchen. Jack stood up, nodded at him with a twisted scowl across his lips and left out the front door. Julius let out a relieved breath. He still remembered the words. He went and closed the door behind his visitor. The sun would begin its downward decent. Soon unfeathered would be hurrying home to stay out of the dark while the winged ones would begin their nightly hunt. He sat on the bottom stair and let his head fall into his hands. He closed his eyes and opened them back in his past, in that one moment where he had learned the words that had kept him alive and whole for so long. “Because it is not my time,” his father grasped his son’s tiny hands. He was ten, just old enough to understand what any of the words meant, let alone remember them. “Repeat them,” every night it was the same routine. His father would say the phrase and Julius would repeat it until his father was satisfied. “No other words are more important. Do you understand?” his father demanded. “Yes, father,” young Julius always replied. His father had kissed his head and left the room for the night. He had been only a child when the world had become dark. His parents had known, had tracked the coming beings for months, maybe even for years. They had always had their noses in books or were watching new programs. He hadn’t understood then. He just knew that as the sun had become dimmer and neighbors had begun to disappear his parents had become more and more protective. He didn’t go anywhere alone and he had no friends any longer. Only her, she was a secret friend. His parents had never known that she had existed. Maybe if he had said something, they would still be here and he wouldn’t be constantly hiding behind walls and words. “It is not…It is not…,” his father sputtered over and over falling to his knees. Julius’ eyes snapped open and he was back in his home. The sky was almost black now. He checked his watch, it was nine o’clock. He was allowed to shut himself away for the night. He turned the lock and the click instantly sent him into another memory. His mother shrieked and screamed like a wild animal in the throes of death. She tore the beautiful wings to a shredded mess. He had watched her scrambling, tearing skin with feathers. The dust had gathered into a pile that resembled ash with a tinge of dark red. “Help me!” she screeched, crawling toward his father. His father only backed young Julius into a corner, holding his wife away with an outstretched foot. “No!” the screamed echoed through the night and had become trapped in the walls. At night he would fall asleep to that echoing din. He had never see his mother after that last moment of desperation. She had crawled out the door and his father had locked the door with a click. Julius was back in his home. Alone and on high alert once again. The night was not as quiet as the night before. Many turned or were taken. The yells and begs for mercy seeped through the cracks in the windows and under the door like a stealthy spirit. He had just been about to fall asleep for his hour when one voice penetrated through the cacophony. “Julius!” she cried. It wasn’t her usual fake cry that was their signal. This was a genuine cry for help. Her time was done, she had been found. Julius ran to the door and threw it open. On his lawn stood two winged ones. Inky black wings as tall as they were, just barely brushing the grass at their feet. Their faces were hidden completely in the shadows. Between them she was held by each arm. Her white T-shirt and shorts shone like a beacon in the night. “I can’t remember them,” panic filled her eyes. “Say them for me, please,” she begged. Her knees gave out and she collapsed onto the grass, head hung low. “I,” he looked up at her captors. This close he could see the outline of their features. One was a no name, the other was Jack. His face was stone cold serious. “Julius,” she her eyes begged him to save her. “Because,” he felt his chest tighten. He knew what this meant. If he said these words, it was all over. She was his. Their fates would be intertwined forever. No longer were either able to make decision for themselves alone. “Because it is not her time,” he let the words fall from his lips, barely discernible. Apparently it had been enough because Jack and no name released her, letting her fall into a heap onto the ground. “Good call. I’ll see you soon,” Jack left with a twisted smile on his face. “Thank you,” she crawled to him, moving to curl up into his lap. He stood up abruptly, causing her to fall into another heap. He turned for his home. She followed him, his home was now hers. “Thank you,” she said again as she locked them inside. “Don’t,” he spat at her. “Don’t say a word,” he turned to go into the kitchen, he needed a drink. Her hand grabbed his upper arm. “Now it is our time,” she moved to kiss him but he stepped back. He walked to look out the window. Neighbors unfurled their wings and flew up into the air, whoops of laughter and joy following them up. Others begged for mercy trying to remember those few word that would give them one more day. “Because it is not…,” he paused, his brain becoming fuzzy. The words were on the very tip of his tongue, if only he could just form them. “My time,” she whispered in his ear and he let a tear fall down his cheek, as she wrapped his her soft yet cold wings around his body. She had finally won. Posted on April 11, 2014, in Short stories and tagged betrayal, dark, defeat, determination, dystopia, feathered, fiction, short story, wings. Bookmark the permalink. Leave a comment.